It seems to be. Scientists at CERN want to use the LHC to a better understanding of the fundamental forces in our universe, who created it, and what will happen to him. They want to recreate the Big Bang and discover what kind of matter existed at the time when the universe was created. They also want to discover new dimensions and open portals to them. It seems that the unusual phenomena occur more often in the vicinity of Geneva (CERN) and the Great Hadron Collider (LHC). According to the pictures and videos that have appeared recently, over the LHC appear strange clouds why many believe that there opens a portal to another dimension. The pictures are really fascinating, but whether they are associated with the mysterious experiments being conducted at CERN? The images were made on June 24th, the same day as the CERN conducted a new experiment called AWAKE. The goal of this The experiment that the particles accelerate as much in a short period of time. However, the results of the experiment are not expected until 2018. CERN is the most powerful particle accelerator in the world and is in the ring long underground tunnel 27 kilometers under the Swiss and French border. The foundation was created between 1998 and 2008 and allows physicists to test different theories. It is known that in the past at CERN conducted experiments to create artificial clouds to better understand global warming. 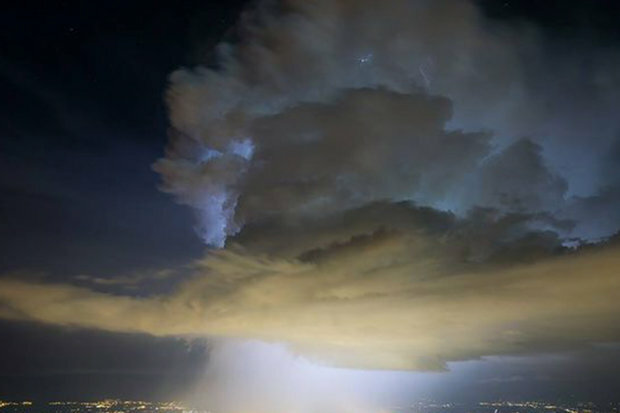 There was also footage of strange clouds June 27 that caused a huge stir on the Internet and the debate on whether scientists from CERN opened a portal to another dimension. Otherwise, according to FBI documents, other dimensions exist, and there is evidence that we visited “creatures” from other dimensions. These entities have on our planet materialized in the form of giant translucent figures. But let’s get back to CERN and portals that open over these institutions. Does CERN really can open a portal to another dimension? Scientists last year conducted an experiment in which they hoped to connect with a parallel universe.